On March 15, the Agriculture Council of America will celebrate its 43rd National AG Day— an event recognizing agriculture's vital role in the daily lives of all Americans. Now in its fifth decade, National AG Day helps raise awareness about where and how food is produced in the U.S. and the crucial role agriculture plays in the our economy by providing us with an abundance of safe and affordable products. It also helps foster our AG economy by promoting career opportunities in farming. 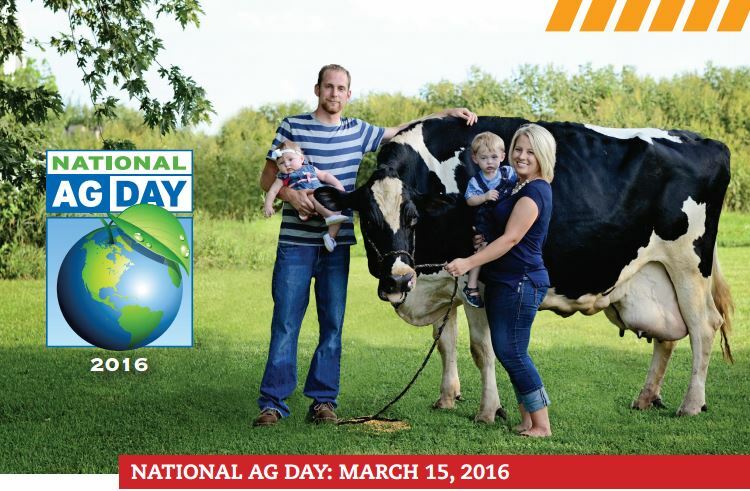 The theme of this year’s National AG Day is “Stewards of a Healthy Planet,” and we at Alliance Tire Group can’t help but feel that theme resonates through our entire organization. As AG machinery gets larger, more powerful, and more advanced—we are committed to developing high-quality premium tires with technology that maximizes its output while minimizing its impact on fragile soils and fuel consumption. At the same time millions of smaller "chore" tractors and towed implements also benefit from our new technology bringing the benefits of reduced soil compaction and reduced down time to farmers at every scale of operation. Helping farmers meet the difficult task of feeding the world, Alliance Tire Group has been busy doing our part by creating a purpose-built tire for every machine on the farm, from our narrow row crop tires used for vegetables to the super-wide flotation tires that haul grain out of the field or bring manure in for natural fertilizer. With its industry-leading line of steel-belted IF/VF tires, Alliance Tires help farmers maintain healthy soils and plants, and keep their fields productive for generations. At ATG, we're constantly refining our tread patterns in an effort to increase traction and reduce slippage, and the advancements we’ve made have helped minimize the impact machines have on the field while simultaneously increasing their fuel efficiency. Our innovation in tire construction and compounds have also increased the durability and longevity of our tires, keeping them in the field longer and out of the landfill (not to mention lowering their total cost of ownership). We know that feeding the world is a big job, and U.S. farmers play an integral role in it. In today's busy world, food has never been more abundant, accessible, or affordable. Sadly, most Americans have never been more removed from the production of it. A few generations ago, almost everyone either was either directly involved in food production or knew someone who was, while most people today think food comes from the grocery store—neglecting to think of the hard work, incredible technology, and people who grow and distribute their food. National AG Day presents an opportunity to appreciate the hard work and dedication of the people in American agriculture, and shines a light on their incredible accomplishments. Thank you, AG! Trent has been involved in the tire industry for more than a decade having spent the last 10 years working for Tyres4U, Australia’s leading independent tire distributor. At Tyres4U he held a variety of positions, rising to be National Sales Manager for AG tires for the last four years. During his tenure at Tyres4U Trent helped promote and build the Alliance brand and established its unique dealer network to support farmers and major OE companies. Trent has experience in all aspects of the agricultural tire industry including sales, marketing, warranty inspections, tire testing all the way down to supporting farmers technically in the field. When Trent isn’t busy kicking tires he has a passion for sports and cattle. His family has a small cattle ranch outside Sydney, but he has just recently relocated to the U.S. Trent currently resides in Iowa, where he intends to continue with his love of cattle in his spare time between family, friends, and the gym.